The footwear maker has fallen in and out of fashion over the years, but lately it's on the outs again. 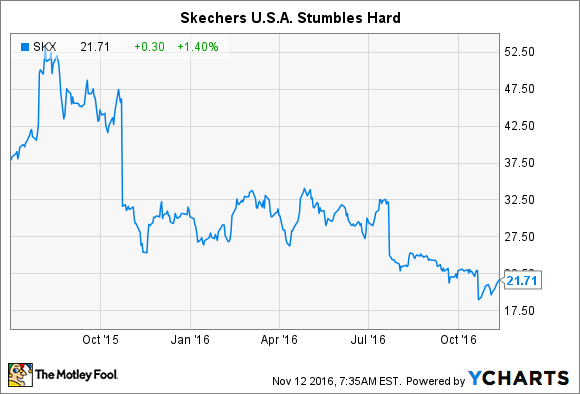 For a sneaker maker that was running high and hard a little over a year ago, Skechers U.S.A. (NYSE:SKX) has fallen fast and long. Going from top tier to also-ran is a difficult outcome to accept, so how was it that a footwear company that looked like it was running away from the competition should suddenly turn and stumble? The footwear industry is a cut-throat business, at least for any manufacturer that isn't named Nike (NYSE:NKE). The Swoosh dominates the industry with around a 62% share of the global footwear market, so that even though it also tripped itself up in recent quarters, it's in no danger of losing the top spot. Rather, it's among the next handful of companies vying for the No. 2 spot where the competition is most vicious. Since its founding in 1992, Skechers has seen its star rise and fall. From those early days when pop icons Christina Aguilera and Britney Spears rocked its shoes, making them the must-have fashion accessory of the day, to the depths of the Shape-Ups toning-shoe scandal in 2012, when the Federal Trade Commission hit it with $40 million in fines for misleading ads, Skechers have come in and out of fashion. And as recently as last year, Skechers was on the rise again. According to the industry analysts at NPD Group, while Nike continued to sprint ahead of the competition as always, Skechers, with a 5% share, was stepping into second place ahead of Adidas (NASDAQOTH:ADDYY), which had a 4.6% share as even Under Armour surpassed it with greater combined sales of footwear and apparel. Yet the glory didn't last long, because as 2015 wore on, Skechers began to fade. While the footwear company had been crushing it over the first six months of the year, Skechers' third-quarter earnings report showed that its domestic wholesale market, where it generates the most of its revenues, saw a dramatic deceleration in growth. Where it had enjoyed 30% growth the year before, sales rose only 12%, causing analysts to revise their outlook for the sneaker maker downward. And it hasn't gotten any better since then, so much so that domestic wholesale sales turned negative in the third quarter of this year. Worse, Adidas jumped back over Skechers to take the No. 2 position in athletic footwear again. Data source: Skechers U.S.A. quarterly SEC filings. So why the sudden change in fortunes? When it comes to fashion, styles always come and go, and Skechers has actually done a fair job of picking up on trends and riding them higher. The toning-shoe craze was one example of it, even if Skechers mishandled it badly, and more recently the rise of athleisure wear has been a more broad-based phenomenon that actually played to Skechers' strengths. Where Nike is the undisputed leader in athletic footwear, Skechers' more laid-back styles resonated with the crowds that were buying yoga pants and wearing them from the gym to other social settings. Skechers shoes did well in both settings, but it also served to make the company something of a one-trick pony at any point in time. Adidas, in contrast, has regained traction by offering a variety of shoes that appeal to many different segments, from its line of Originals and more contemporary styles like Yeezy, to signing key basketball and football players to wear its kicks. NPD says Adidas might not be within striking distance yet of Nike, but as the industry leader itself stumbles. it is gaining ground while Skechers falls further behind. Data source: NPD Group, Yahoo! Finance. Keying in on trends has worked well for Skechers when it finds the right one to back, but otherwise it's left casting about for something to latch onto, and that's led to volatile results. With Skechers domestic markets still falling, it's not certain that increasing its geographic reach as it is attempting will necessarily reverse the outcome. Skechers U.S.A. has lost its cool factor and allowed Adidas to sprint ahead. If it's not careful, it may find Converse running over it, too, while consumers kick it to the curb.